September 20, 2010–Readers of California Desert Art are invited to the opening of Kevin Stewart Fine Art in a new location in Palm Springs, on Friday, October 1st, from 5 to 7 pm. Kevin Stewart—along with his wife Diane–are respected dealers and appraisers of California art and experts on the early desert painters. Their new gallery will be in the historic Pacific Building, built in 1936, and once recognized as the gateway landmark of Palm Springs. The Pacific Building, built in 1936. The gallery will specialize in early California artists, as well as early and 20th century American artists and European artists from the 1600s to 1950, along with select antiques. The Stewarts owned the Stewart Galleries in Palm Springs and San Diego from 1986 to 2001, then sold the downtown PS gallery to concentrate on the appraisal business. Since then, Palm Canyon has become a stronghold of modernist shops. Come welcome classic California art back to the neighborhood. 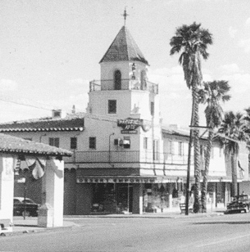 The Pacific Building is at 798 N. Palm Canyon Drive, at the corner of Tamarisk and North Palm Canyon. Valet parking will be provided for the opening. Information: (760) 327-7000.
purchased a painting in 1998 from Carl Bray, how can I find out the value? thanks. I have two excellent Cleeton Paintings that I would like to sell before my move. If this is something you are interested in having in your gallery, please intact me. This is a belated answer, but for others looking to price a painting I’d suggest checking auction prices at AskArt. There’s a small fee to see auction prices, but it’s a lot less than an appraisal. Unless your painting is worth a ton, this is a good way to go. Kevin Stewart gallery has moved to Santa Barbara since the above post was posted, by the way.